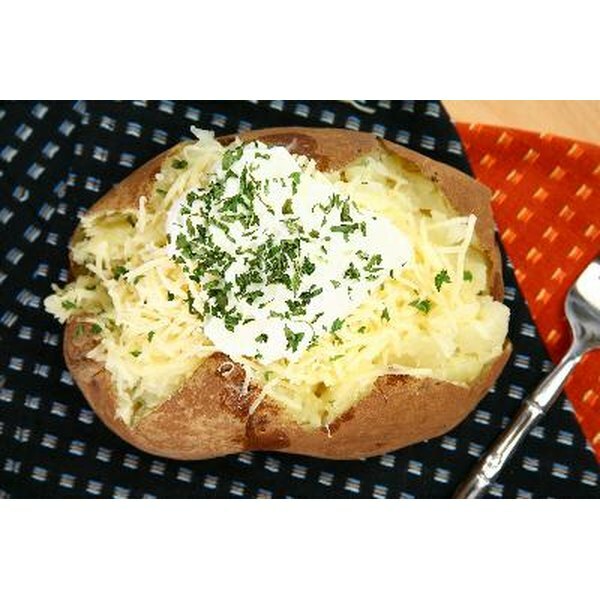 Foods containing carbohydrates, such as baked potatoes, breads, cookies, pasta and rice, occupy the most space on many plates, make up the main course of many meals and are major contributors of energy in many diets. Carbohydrates, composed of carbon, hydrogen and oxygen, are present in most foods as starch. The process of digestion breaks them into their basic units of glucose to be absorbed. Carbohydrate digestion starts in the mouth and takes place as long as the food remains there. Salivary amylase, an enzyme in saliva, breaks the complex chains of starch called polysaccharides into disaccharide molecules called maltose. Made up of two units of glucose, maltose has to be broken into single molecules of glucose to provide energy. Salivary amylase cannot accomplish this task, so the disaccharides move down the esophagus into the stomach. No action takes place on carbohydrates in the stomach. Digestive juices secreted by the stomach stop the action of salivary amylase, which cannot function in the acidic conditions. The food in the stomach mixes with the juices and moves into the small intestine. As food makes its way into the small intestine, the pancreas releases an enzyme, pancreatic amylase. Any polysaccharide, not acted on by the salivary amylase, is broken into disaccharides by the pancreatic amylase. Other digestive enzymes attached to the surface of the small intestine, split the disaccharides into two monosaccharide molecules. Maltose splits into two glucose units, while sucrose breaks down to one glucose and one fructose unit; and lactase into a glucose and a galactose unit. The monosaccharides are then absorbed by the small intestine and enter the blood stream. The human body is efficient at using most carbohydrates consumed as starches. However, it cannot break down fibers found in legumes, vegetables and fruits. While bacteria in the large intestine ferment some of the fiber, fiber such as cellulose remains unchanged by the process of digestion. Instead, it absorbs water and adds bulk to the undigested food that is excreted.